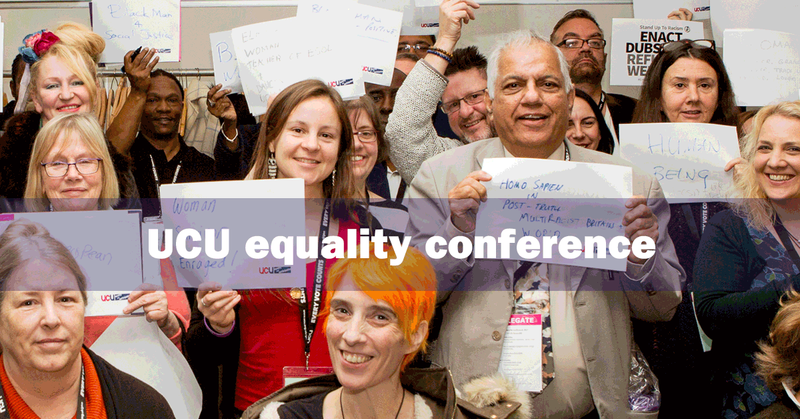 UCU's annual equality conference combines a joint equality conference for black, LGBT, disabled and women members as well as dedicated sessions for the four constituencies, joint sessions, various workshops and guest speakers. Equality Groups Conference 2018 will be held at Manchester Conference Centre from Thursday 29 November - Saturday 1 December 2018. The conference will hold four small half day conferences and a plenary session for all equality strands. This will mean not all delegates will need to be at the conference for the full 3 days. There were FE & HE workshops delivered by Andrew Harden (head of FE) and Paul Bridge (head of HE). The 2016 conference took place in Birmingham from 1-3 December. The conference included conferences for the four equality groups and a plenary for session opened by Vicky Knight, UCU vice-president. The session was based on 'supporting members after Brexit' and discussed the rise in racism and xenophobia since the EU referendum, the immigration issues that may face our members and the potential impact on equality and employment rights. Speakers included Dawn Livingston, Organiser with HOPE not hate, Sally Brett, Senior Policy Officer, TUC and Kirsten Forkert, UCU member at Birmingham City University, Malia Bouattia, NUS president, Cooper Bates, Leeds City College, Trish Fay, Durham teaching assistant & Sara Tomlinson, NUT. This conference was held over 3 days at the View Hotel in Eastbourne. The conference included equality strand session, workshops and guest speakers. More information can be found here UCU685.html.